1st August 2012 - It is now three weeks since we arrived in Madeira and we still have not seen the 'official' tourist sights, rather doing our own visiting of the Island. In the first week we hired a car and drove over to Santana on the north coast. The drive over, through and down the mountains was spectacular. The vegitation is so green and lush - the colours of the flowers are so vibrant. The temperature was recording 36 degrees Celcius outside but we drove through the mountains with the car windows down - even though the car had working air conditioning. The woody scents tinged with pine, musk, spice and fragrant blossom were just wonderful. 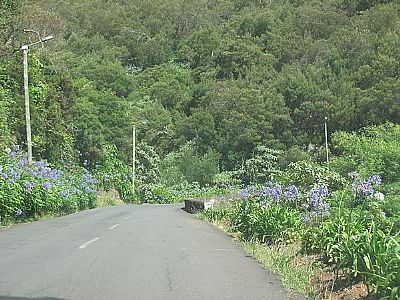 The road, lined with brilliant blue hydrangea and agapantha, wound through the peaks of the mountains, down the valleys and through the tunnels cut into the landscape. We drove out of the sunlight into the dark tunnels, bursting out of them again into brilliant sunshine and wonderful scenery. The pretty villages of Faial and Santana sit on the North Coast where the brilliant blue sea catches the north/north east wind and throws itself against the towering columns of lava put there so many years ago. 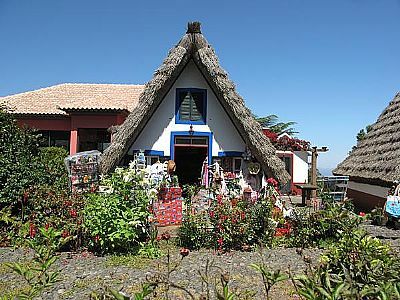 From Santana we head back over the winding mountain road to Ribeira Frio at 880 metres (Cold river) where we stopped to enjoy some lunch. The birds were singing in the forest behind us and the view in front showed us where we had climbed from. After lunch we drove onward and upward, passing a Trout Farm on the way to the Pico do Ariero at 1810 metres. The landscape changes as we drive higher with a distinct move from the green lush hillside to more arid plains as the topsoil thins. From here you can walk along the ridge and back up to Pico do Junical. 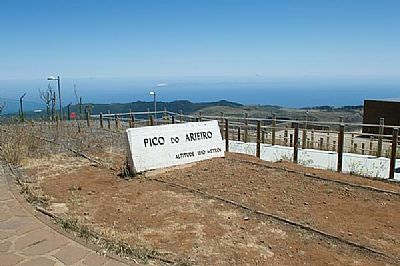 pic: Confirmation of altitude at Pico do Ariero. As we hadn't intended to walk our footwear for the day prevented us from taking this route, but we did enjoy watching the enthusiasts. As they passed by the various greetings indicated how strenuous their journey had been. Some were able to give us a cheery hello, others smiled over their hot, sweaty weariness while others just couldn't lift their heads in the attempt to reach the car park and a cold drink. We sat on the rock watching the wagtails and lizards and listening to an enthusiastic group of climbers over on the Junical calling out and listening to their own echo returning up the valley. A few days later we went a little more west heading back into the mountains to Eira do Serrado at 1095 metres. The road up the mountain is single track with the occassional passing place. This is fine unless you either get stuck behind the cement mixer on its way to the construction site, or meet the tour bus on its way down from the view point. The mixer did eventually find somewhere large enough to pull over and let us all pass. The bus - well we had to give way to might! As we walked up the path to the view point we noted the cigarette butts lying on the path and commented on this as it is the first litter we have really seen here and the landscape around is quite dry. We were later to hear about the forest fires that swept down the mountain while we were making these comments. From Eira do Serrado we drove down the valley to Curral das Freiras, a hamlet nestled deem in the valley. 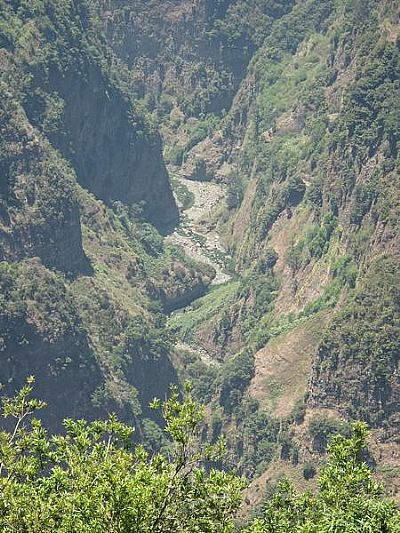 The tourist book tells us that this is the 'button hole' of Madeira. It is also the place where the Nuns would run to for safety when they spotted pirates and marauders on the horizon, many years ago. We wondered at how they managed to 'run' here when the path that they would have taken is so extremely steep and winding! On our drive back to the Marina the road signs were telling us of road closures due to the forest fires which had broken out in anger that morning and continued throughout the day. As we approached the airport area at Santa Cruz the evidence was clear of the damage with swathes of blackened lands. On the bridges over the gulleys local people, with tee-shirts over their heads to protect themselves, were using their garden hoses in an attempt to get water onto the fires and help put them out. A valiant attempt by all the firefighters and the locals eventually got the fires under control but it took nearly 3 days. 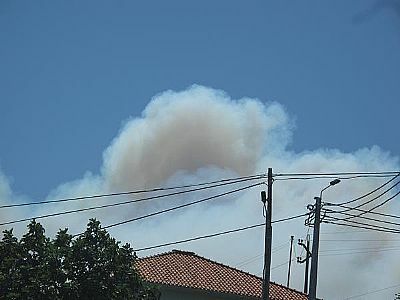 Portugal sent in an additional 80 firefighters but aerial support could not be sent as the mainland, Spain and the Canary Islands were all fighting raging fires themselves. We did wonder how many of the cigarette butts we spotted were replicated across the view points and the walks - and how many of them may have contributed to some of these fires! Our next road trip was along the south coast as far west as Calheta. 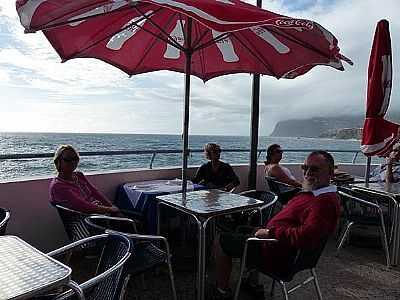 On our way we stopped in at Camara de Lobos, Ribeira Brava and Ponto do Sol. The first thing that struck us on leaving Funchal was the change in plant life. Everywhere we looked were Banana Plants, all heavily laden with bananas. These plants were growing in every garden, on every terrace and as high as you could see up the side of the mountains. 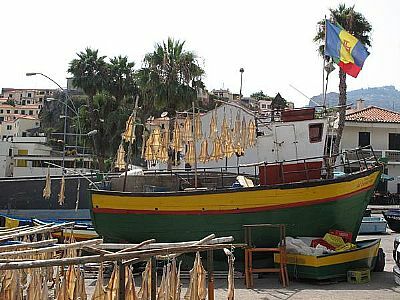 At Camara de Lobos we parked up and took a stroll along the little fishing harbour. The church overlooks the harbour and on the day on our visit it was packed to overflowing with the men sitting outside on benches and on the steps, listening in to the service. The name of the village apparently means 'Room of the Wolves' and was visited by Winston Churchill who used to spend his time here painting. Another feature of the harbour was the fish which was strung up and left to dry. Before leaving Camara de Lobos we drove out of the village on an extremely steep road towards the cable car. The view was stunning but we didn't stop as we were worried the car would roll back down the hill. It was first gear all the way up! It was then on to Ponta do Sol (Point of the Sun - apparently it is the first place in Madeira each day to see the sun) to look at the Marina there. 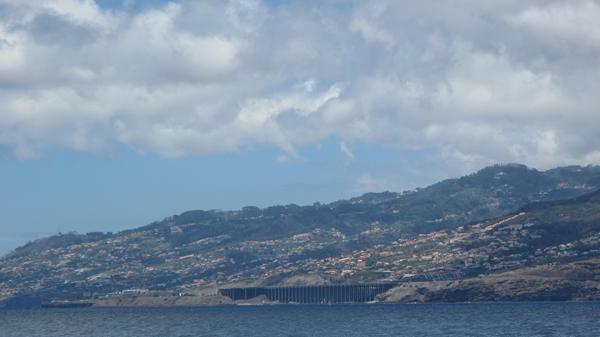 During our research of Madeira for our sailing trip here we noticed that the Marina here had not been finished. The Pilot Book we were using was dated 2004 with an update of 2009 so we thought we would take a look to see if it was complete. What a disappointment! A wonderful area with purpose built marina office and supporting facilities all locked up and starting to fall to pieces. Pillars numbered for pontoons but no pontoons. The entrance was filled with rocks so there is no way any boat of any kind could get in or out. All very sad. We found out that the breakwater had not been constructed properly and was damaged in the first storm. Thereafter everyone was blaming everyone else with the resultant stalemate. We felt it could be utilised if the powers-to-be could just move away from the Marina concept and install a sandy area for sunbathing etc. The water area could be used as a Learn-to-sail area providing a safe and secure place for youngsters to learn to dinghy sail, windsurf, snorkel, dive etc. Oh well! On our way to Calheta we took the shore road however when we got the the Marina it was to find that the road was closed due to construction - with 100m to go to the Marina. So, back up the hills we went and found our way to the town via another route. We finally parked up at the town car park and walked along the promenade toward the Marina. Its a very nice area with lots of waterside eating places, a couple of large hotels and lovely swimming/beach area. The Marina is fairly large and looks as though it has all the facilities you would need. We had a lovely lunch at one of the restaurants -I enjoyed a Prego Special, which is a Steak sandwich with ham, cheese and fried egg! 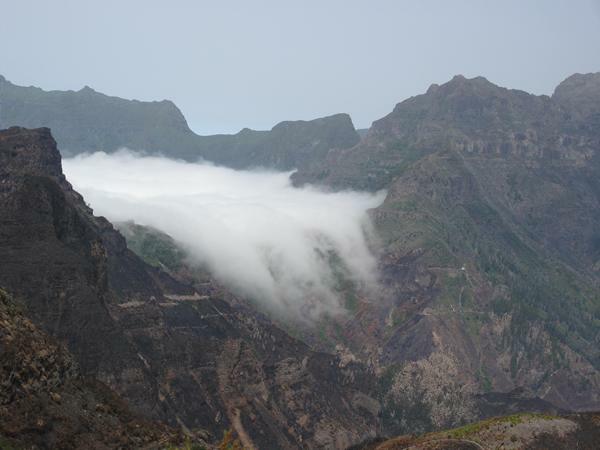 It’s been two weeks since our last update so time to tell you some more about our travels within Madeira. We have a hire car so some of our time has been spent finding our way around the Rapido and streets of the island: Identifying supermarkets, shopping centres etc, and exploring these. So far we have managed to find the main Shopping Centres – Dolce Vitae; Forum Madeira; Madeira Shopping. We also found the AKI store (which looks a bit like the equivalent of B&Q), Shopping is now much easier with the ca,r which is a relief as we always buy more than we intended to and its always heavy goods. 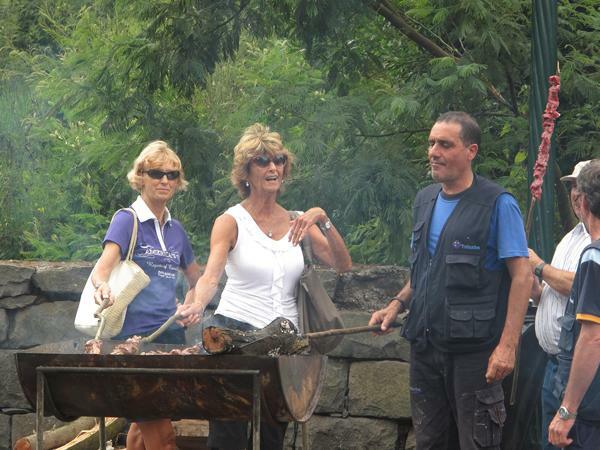 Machico was holding its Gastronomy Fair in the first week of August so on Friday night we went with Bob and Lin from Ile Jeudi and enjoyed eating Espada with banana and passion fruit (a local dish) whilst listening to the local musicians and people watching. It was a lovely relaxed night out. On the following Sunday we took a drive to Santo de Serra market where we tried our first Poncha, and sobered up with a lovely roast chicken, salad and chips - 18 euros for 4 of us! On 7th August Peters sister and her friend arrived for a week’s visit. This allowed us to move from the status of ‘Visitor’ to that of ‘Tourist’. The first half of the week was spent showing them the parts of the Island that Peter and I had already visited. The Flora is not as green as it was when we arrived as the season has moved on, large swathes are blackened after the fires and as yet no rain. The blue and white of the Agapantha and Hydrangea are giving way to the orange of Montbretia and the yellows of the Ginger Lily. 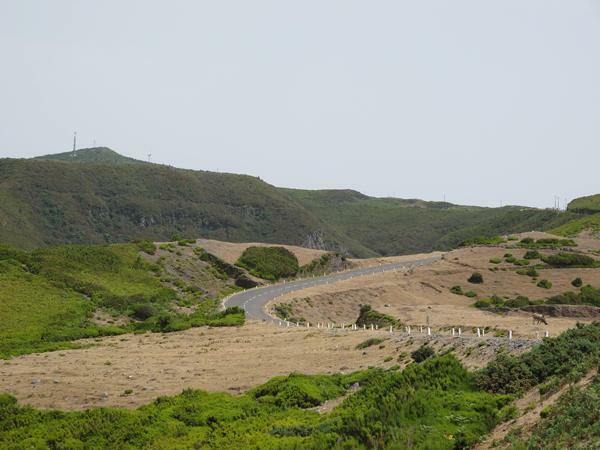 A drive along the north coast road between Santana and Sao Vicente provided us with some breath stopping moments. The road is single track with solid rock on one side and the crashing Atlantic on the other side. Passing places are provided but these are quite narrow. Travelling along the winding road with blind bends and dark tunnels, which threw huge drops of water onto the windscreen when you least expect it, was an experience! 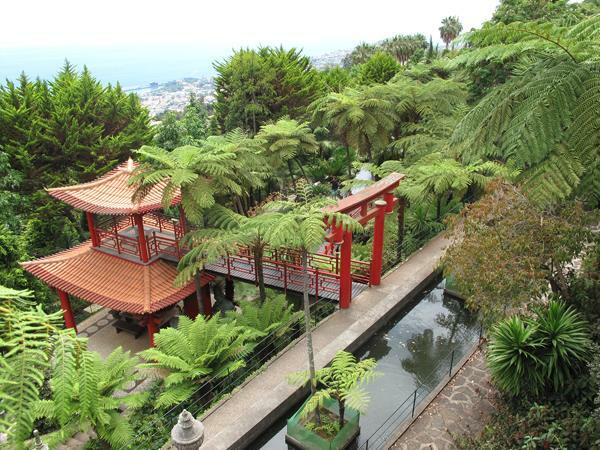 We took in the Cable Car in Funchal and headed up to the Tropical Garden and the Church at Monte. 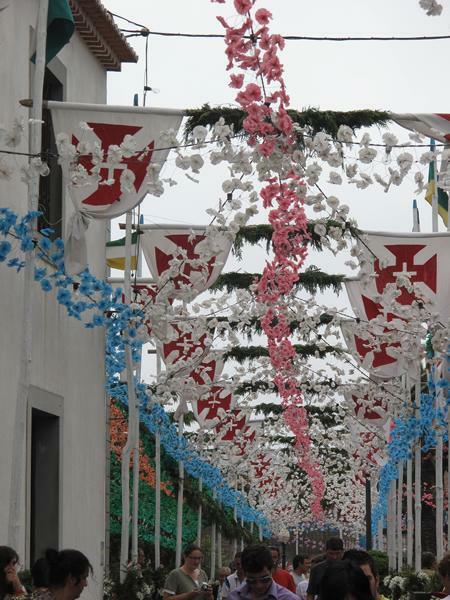 The Church was decorated for the Festa that was taking place in the lead up to the public holiday on 15th August. 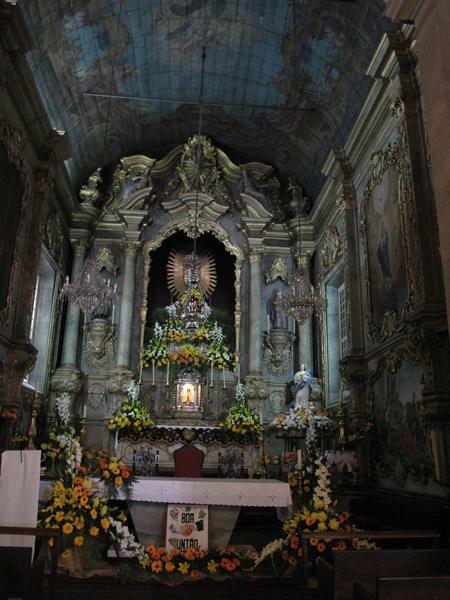 We are reliably informed by the lady at the Poncha stall that the the flowers in the church are changed every day and each day a different village is responsible for the new flowers. Outside was the bar selling ‘Peter’s Poncha’. Needless to say we had to stop and try a variety of local cocktails…. None of which made us brave enough to try the Toboggan ride down the hill. Maybe next time! Our walk around the Tropical Garden was lovely. It is quite a special place and extremely well done. We will definitely be visiting again, taking a picnic and spending a day in the garden. A lot of the flowers blooms were finished but it is still a beautiful place to visit. Sunday saw us at the market in Santo do Serra. Peter and I had been the previous Sunday with Bob and Lin (CA members who are in the marina en route to the Canaries to set sail across the Atlantic). We had tried the local Poncha there the week before, met with some local sailors who welcomed us to the area and chatted with us (interestingly they had spent a lot of time in UK in Macclesfield and Prestbury which is local ground for Peter and Bob). This weekend was Festa for the town so the market was very busy. We tried the Poncha and cider again and then, after admiring the local produce and baby wildlife for sale, headed toward the Church and the main street. The Church grounds were adorned with the strung flowers that we have seen all over the island, the band was playing in the bandstand and the Carpet of Flowers was busy being put together. This carpet is cut green Cyprus branches overlaid with flower heads and petals which form the decorative pictures. 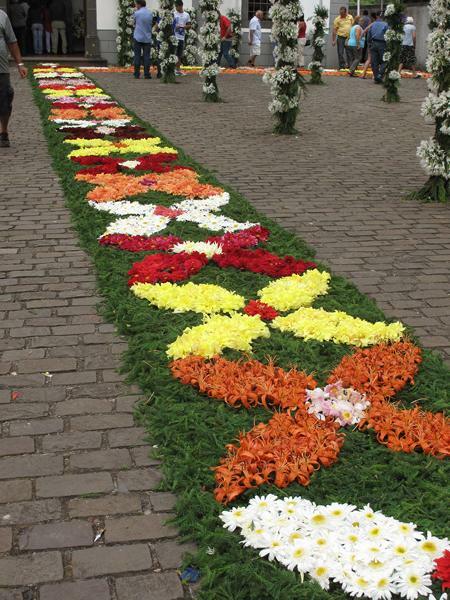 The scents were powerful but the end result was a wonderful ‘carpet’ that ran all round the church grounds. After admiring this we headed into the Quinta park for a stroll around the gardens. Then we were back in the main street thinking about lunch. 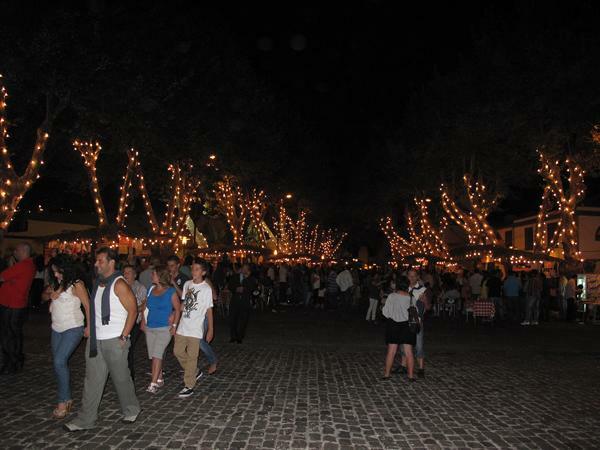 Espatada was definitely on the menu with stalls set up the entire length of the main street. Outside each stall were one or two half drum barbeques with the fire ready to cook. 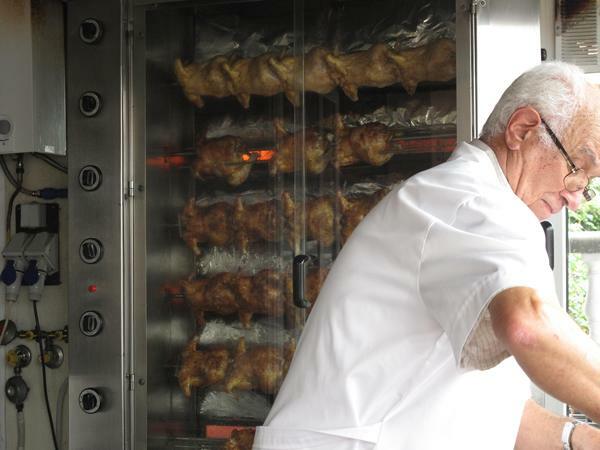 A cooked chicken straight off the Rotisserie was purchased for Peter, along with a round of hot potato bread split and spread with garlic butter. We decided on two small skewers of meat – which is cut from huge haunches of beef hung in the stall. It is then dipped into salt, bay and herbs before being skewered on a laurel branch and cooked over the open fire. The local gents were good enough to give us advice on how long to cook the meat, when to turn it and when to knock the salt off. A very tasty lunch – but next time I’ll take the wet wipes! 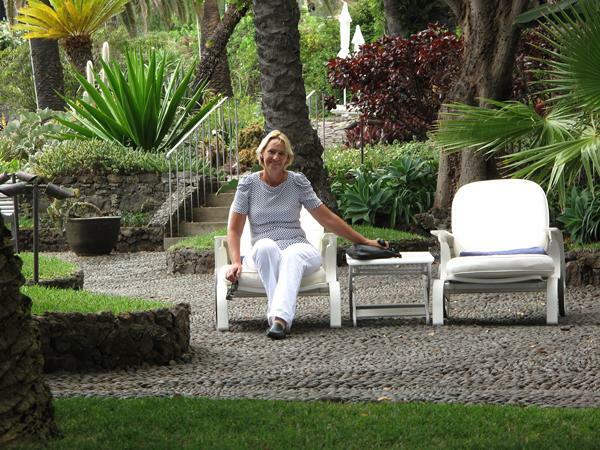 A day shopping in Funchal for gifts led us to the famous ‘Reids Hotel’ where the concierge welcomed us and gave us a quick tour of the ground floor then left us to explore the rest of the hotel on our own. We walked around the lower level admiring the display of photographs showing Reids and its guests over nearly a century. We then took a walk through the gardens back to the main building. Cream tea was being served but we decided we would try that another day as at 120 euros for 4 of us we felt it a bit extravagant for the day. 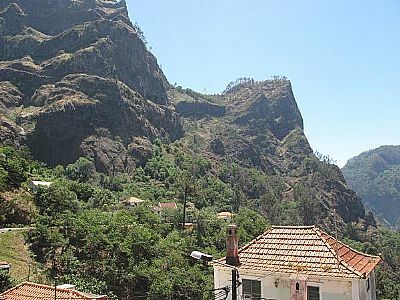 A drive back along to south of the Island toward Prazera had us driving up mountainous roads, heading for the National Park and Paul da Serra. The arduous road was worth it when all of a sudden you have reached the top and the view of the Mountain Ridge and Gorge take your breath away. Heading east along the road we drove past some cows munching what was left of the dry grass. After stopping at the hotel/bar for a cool drink we continued driving past the wind turbines - an amazing engineering sculpture that is so graceful set against the enormity of the mountainous terrain. They languidly turned in the gentle breeze, making no noise and disturbing nothing. As we continued east the road began its decent with us all screeching for the car to stop when we rounded one bend and found a 'waterfall of cloud' pouring through a gorge and down into the valley below. Every mile or so after this we had to stop and admire the views, smell the scents and stand in awe at the beauty of this wonderous island. On Wednesday 15th the visitors leaded back to Italy on the 5am flight. We went back to sleep for a couple of hours and woke to find a fine drizzle of rain. I walked up to the Marina bar to buy some fresh bread, inhaling the scents of the trees and the warm earth as it gave off an almost audible sigh of relief at the rain. By the time I got back to the boat the brown paper bag with my hot bread was quite soggy (as was I) – the rain had increased to a steady downpour. It only lasted for the morning though so it wasn’t quite enough to repair the drought damage. Yesterday we checked the GRIB files and noted that over the next 4-5 days Madeira will be sitting on the edge of two Tropical Storms. Neither of which look as though they will throw any wind or rain our way. One storm is heading east to the north of us (Gordon) with the other heading west to the south of us (not named as yet). We have met some really nice and interesting people in the Marina over the last weeks. Salvatore and Anna, their friend Bob and their grandson, all from Belgium invited us to join them for dinner at Gabrielle's Bar near Ribiero Frio. Its a small bar which only serves food to 'friends' and on booking so you can't just turn up. We had a lovely evening getting to know our new friends and relearning our French. The meal started with home made lemon Poncha, followed by Roast Chicken pieces with potato, carrots, pimpenela and jugs of home made red wine. Then the Espetada arrived with more wine. Pudding was creme caramel and agua dente. In fact it was such fun that we repeated the event a week later but for lunch this timeand joined by Jean-Louis who is on the Hallberg Raasey moored next to us - we had even more food served for the same price - fish with the veg, followed by chicken pieces with rice and peas, creme caramel and coffee. A wonderful home cooked meal for 12 euros a head. Over the past 6 weeks we have been so enchanted with the Island that we have decided to winter up here. This means that our trip to South Africa will be postponed. We will still visit SA but will be flying there for a few weeks instead of sailing. We do not want to repeat our winter stay in Malta by staying in a hotel again for the 6 months so we have decided to take a house for the winter. We found one in Santo da Serra which is about 700 metres above sea level but is only 20 minutes drive from the marina. Its a little cooler than at sea level, which suits us as we can have the best of both worlds. There is a garden to keep Peter busy and the nicest part is that we have enough room in the kitchen for us to once again cook meals in more than 'one pot'. We have started 'moving in' which means lugging all our stuff out of the boat. Its a good opportunity to clear out! We are quite excited about the fact that we have a good sailing area here and we plan to spend the next few months sailing here. We have the opportunity to sail around Madeira, sail to Porto Santo, Desertas Islands (all can be done in half a day, stay over or return same day) as well as just going out for the day to Funchal etc. At the end of October the boat will be hauled out and put on the hard standing at the yard which is under the airport runway. pic: The airport - the pillars are holding up the runway. the boat storage yard is between the pillars on the left hand side. It has been a few weeks since my last update, during which nothing too exciting has happened in the way of sailing. 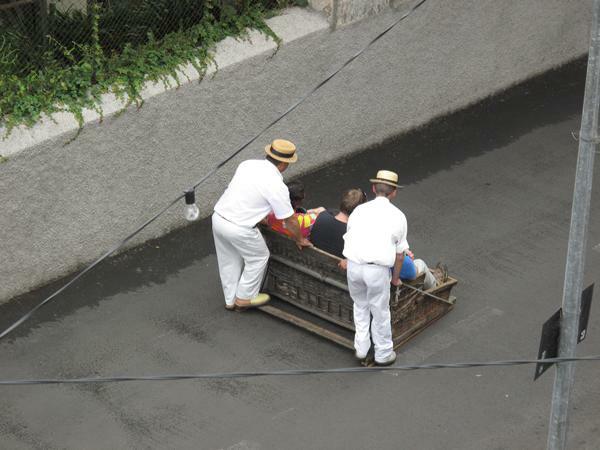 A return to the UK for a family funeral left Peter on his own in Madeira. He did however take Red Ruth out for a day's sail toward Funchal. A friend of ours accompanied him and, from all accounts, enjoyed his first experience on a 'proper' sailing yacht. The weather during September was affected by Tropical Storm Nadine which sat out over the Azore islands for a record 19 days without moving. As the Island of Madeira was on the extreme edge of the storm it brought mostly rain, which was most welcome, and not too much wind. The brown grass and burnt out foliage certainly changed overnight, returning to green and new growth spurting from the burnt out remains. This weekend past we had planned a day trip out however a check of the weather put paid to our plans. The wind turned to a South, South Westerly with 1-2 metre swells. It would have been quite uncomfortable with an uneasy entrance to the marina, which faces south west. Our friend, Salvatore, has returned to Belgium to prepare for his return and his sail across the Atlantic later in the year. 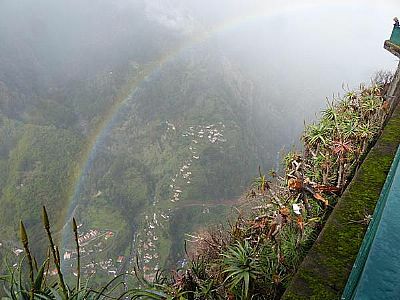 Jean-Louis has arrived back in Madeira to prepare for his trip to the Canaries, before setting out across the Atlantic. He and his wife came to visit us on Sunday so we visited the local market, tried the Poncha and returned to the house for a BBQ and some French wine. We had a lovely day with good, sunny weather. From this week we have visitors to the Island until Mid November. We are looking forward to seeing everyone and sharing our pleasure in the Island with them. Red Ruth is out of the water and is in her winter home. We have taken all our belongings out of her so she can now breathe a sigh of relief - her waterline is probably a good 4 inches higher than it was. No doubt in the summer we will take care of that when we put it all back in again! The trip from Quinta De Lorde took Peter and Allan a whole 30 minutes under motor. A following tide gave them 8 knots over the ground so they were there before Jo and I could finish our Coffee and drive to the yard to pick them up. The keel gave the yard a little bit of a challenge again (same as in Malta) and once again we had to loosen the back stay and release the forestay. This time though we almost had to release the baby stay. The de-humidifier is on and all is well 'down below'. Our visitors have gone home after a bit of a washout in terms of the weather. For the first w eeks of November, up here in the mountains, it rained... and rained.... and rained... and rained. After the second day we finally clicked that the weather down at sea level was drier and warmer so we tried to go out every day and get some sun. 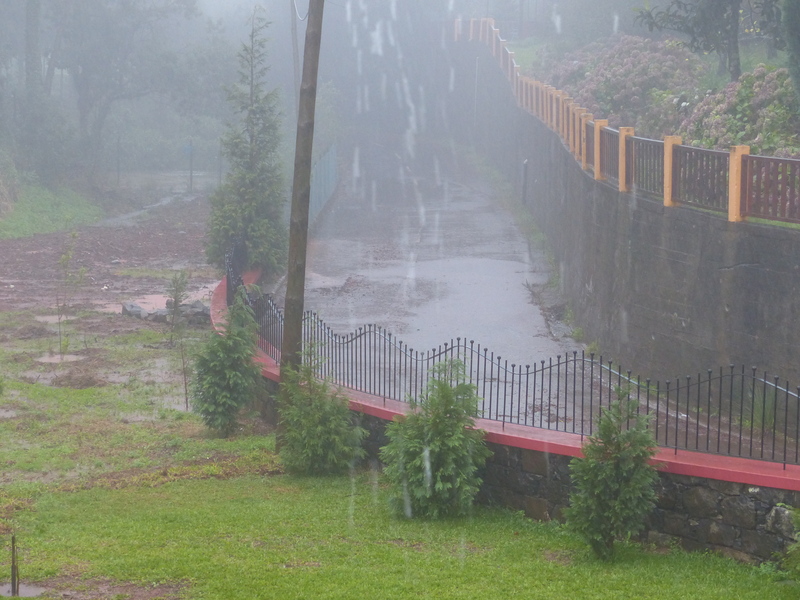 Pic: And so it rained - the road is somewhere under all that water! We had some lovely walks along the promenade and again through the Botanical Gardens. As its November the flowers were not at their best, but still spectacular in their own right. We found some local restaurants and bars, enjoying partaking of their wares! pic: All the way round rainbow at Curral de Freiras. Pic: Enjoying the warmth and the sun whilst the weather rolls in behind us. The rest of November has been spent planning our trip to South Africa. We'll put this on another page and hopefully will update it as we tour around the country.